This episode is all about Leadership. I have Bernd Geropp with me. The man with Leadership in Mind. First of all I’m sure, everybody sooner or later comes across leading. Other leaders might affect you directly. Or you might become a leader by yourself. Because for this topic we’ll need a valid expert, I have asked Bernd to join us. Bernd Geropp is a successful consultant, inspiring trainer, and empathic coach for leadership. He’s a former company owner who has found his purpose in making better leaders. 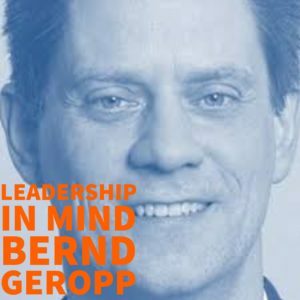 Bernd leads German podcasting scene for Leadership topics. In Mehr Fuehren – Führung auf den Punkt gebracht” which is More leadership – Leading in a nutshell he contributes worthwhile details every week. He has raised the Leadership-Platform to support his members becoming better leaders, get the coworkers they want and gain more time for the really important things. We’re tackling topics about how to become a better leader. Or ways you can handle micro-management if you’re confronted with. And if you detect yourself has become a micro-manager you need to know what are the underlying reasons. Sooner or later, inevitably you stumble over trust. And how to become a better leader by building trust. However, it is very hard to build trust. While building trust you can also easily loose it in a second. As a result there are tons of obstacles and problems hidden underneath. One good entry point would be to participate in Bernd’s 3-part video training How to become a better leader for free. He shows you the essentials about leading and delegation. If you’re capable of German you definitely should have a look into it. Stay with me and enjoy the interview. What do you think is the hidden purpose of micro-management? Why does extrinsic motivation not succeed? Which 3 things do intrinsically motivated people look for? How can you handle your micro-managing boss? Why thinking your boss is an idiot does not help you? How can you handle your own micro-managing? Why trust is essential for delegation? Why mistakes are essential for your managing carreer?